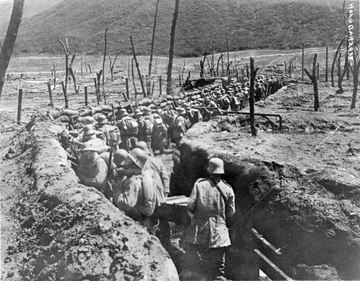 The autumn of 1918 brought with it the prospect that The Great War would end in a few of months. Soldiers and citizens were beginning to feel uplifted again, and plans were underway for post-war celebrations. The annoyance of catching a cold was nothing in the scheme of things. But what no one realized was that this was not an ordinary cold; this was an influenza virus that would leave between 20 to 40 million people dead around the world within the next year! That's more than all who died during World War One. One-fifth of the world’s population would come down with what was being called the "Spanish Flu." (The name was the result of the more than 8 million who died from it in Spain.) But it was believed that the virus began in China in the autumn of 1917, and spread slowly around the world during the spring and summer of 1918. How did the flu virus get to Europe from China? 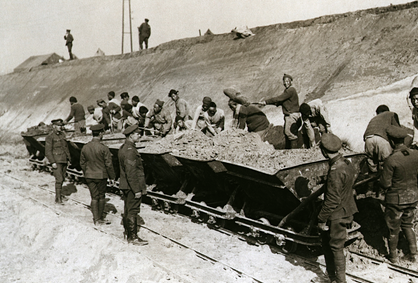 Recently a Canadian historian discovered that 96,000 Chinese laborers were sent to Europe in the fall of 1917 to assist with work behind the Western Front. And the virus spread easily. Any one who had caught the flu was a carrier releasing the virus into the air whenever the infected person talked, coughed, or sneezed. Medical personnel realized that this flu killed quickly. 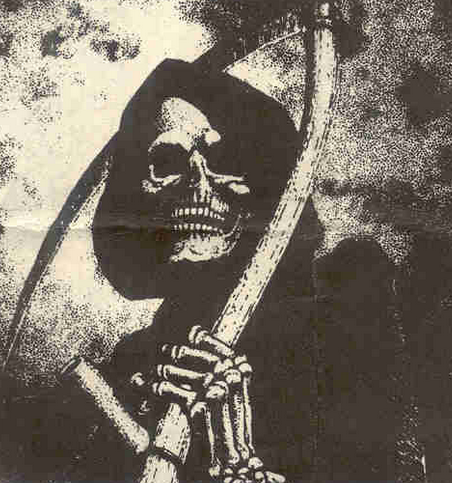 There were numerous reports of people going to work in the morning, becoming sick, and being dead by nightfall. One medical expert said that the type of pneumonia that set in was the most dangerous he had ever seen with patients suffocating on the bloody foam that lined their airways. 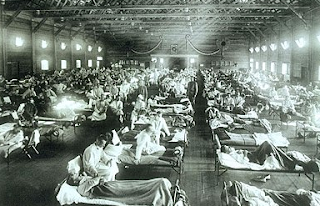 More than half a billion people were infected around the world with the most deaths occurred during October and November 1918. And there were no known medicines to stop its spread. 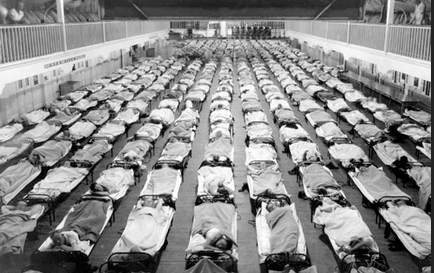 (The first flu vaccine came about in the 1940s.) This virus would become the most devastating epidemic ever recorded in world history, to date. 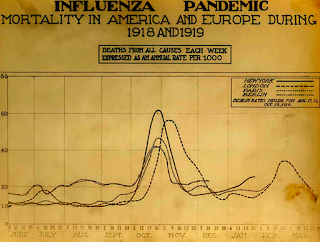 In the US, more than 675,000 Americans died of the flu – 28% of the population. This virus was different from past viruses. Instead of taking its toll mainly on children and the elderly, it attacked those between the ages of 20 and 40; that was the unexpected demographic dying in large numbers. Native Americans were also extremely hard hit. 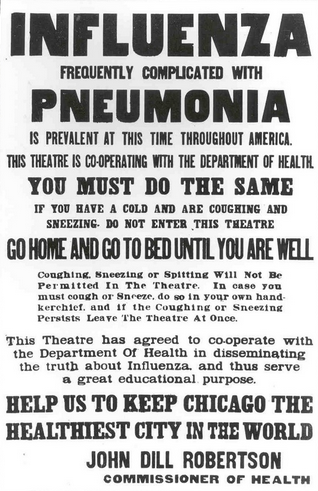 And many who survived The Great War came home only to succumb to the influenza virus. In fact, adding the number of soldiers returning home from foreign lands, and the number of parties and celebrations planned for Armistice Day in the US, and the virus continued to spread quickly through the end of 1918. To make things more difficult, those returning home from the war came with battle wounds, chemical weapon burns, and what we now know as PTSD. 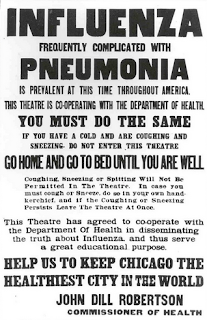 Hospital and doctors were already short-staffed and overworked when the affects of the flu began to be felt. 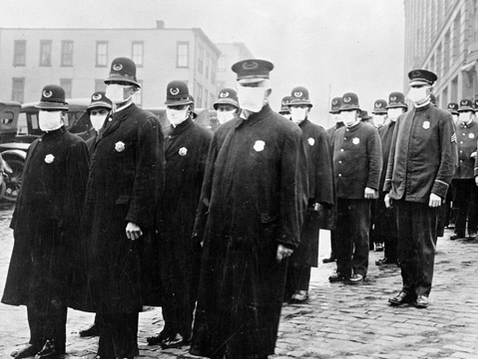 By the summer of 1919, the Flu Pandemic was coming to an end. 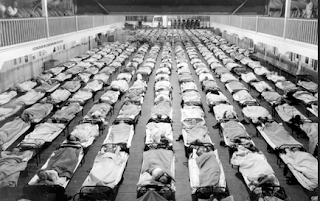 Years later, researchers would discover that what fueled this severe outbreak was a combination of things: abysmal sanitation and hygiene conditions, poor nourishment, and overcrowding in military camps and hospitals, and in cities and towns, once the disease spread. Today, flu vaccines and super antibiotics help reduce the possibility of another severe flu outbreak worldwide. But there is always a chance that a virus will rapidly mutate and medical science could be caught short of having the necessary treatment at hand. 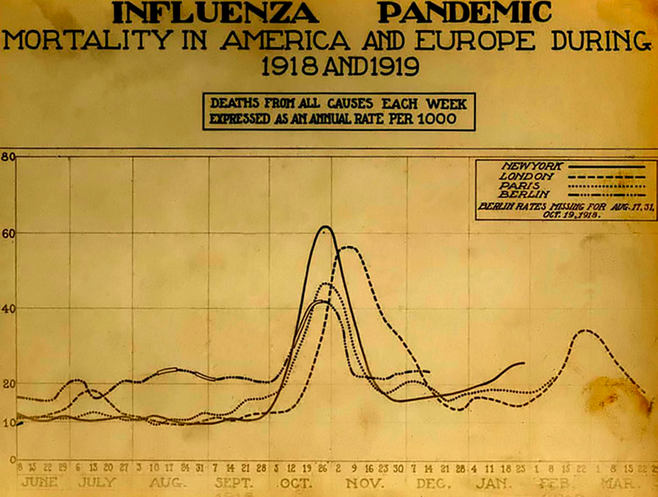 In fact, experts say it's only a matter of time before another flu pandemic occurs. Why Do We Wander Cemeteries?